In the long history of the turf only one horse has ever been awarded as “Horse of the Year” five times. To achieve such an unparalleled milestone, a horse would have to be consistently dominant for over three times the average career length most acclaimed champions raced. The one horse to do this incredible feat was the mighty Kelso, American Horse of the Year from 1960 to 1964. 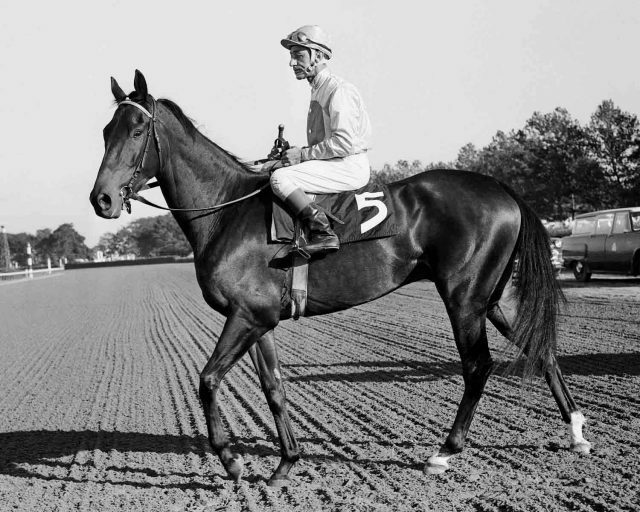 Kelso was born on April 4, 1957 at Claiborne Farm in Kentucky. His breeder was turf patron Allaire du Pont, who campaigned her grey and yellow colours under the banner of Bohemia Stables. The elegant Mrs. Du Pont was one of the great lady owners in racing. Her stable was based at Woodstock Farm in the Chesapeake Bay area in Maryland. She was a great sports woman having been an Olympian in trap shooting and was a champion tennis player. This always active woman also flew gliders and set an endurance record in 1935 in the discipline. Allaire du Pont was one of the first women to be admitted as a member of The Jockey Club in 1983. She was also a co-founder and member on the Board of Directors of Thoroughbred Charities of America, an organization whose activities include raising funds to save retired horses. She devoted both time and money to other charities such as Paws for Life, Mid-Atlantic Horse Rescue, Greener Pastures, and the Union Hospital. Mrs. du Pont sent her stakes placed mare Maid of Flight for a breeding encounter with Santa Anita Derby winner Your Host in 1956. The resulting foal was none other than Kelso, the horse that would take Allaire du Pont to the top of the thoroughbred world and stay there for five years. She named Maid of Flight’s son Kelso in honour of her friend Kelso Everett, who answered by the nickname “Kelly”. The horse Kelso would also have “Kelly” for a nickname and answered to his handlers as such. Your Host was a son of the very good sire Alibhai, who in turn was a son of the epoch sire Hyperion. Your Host was from one of the emerging top families in American racing as his dam was Boudoir by Mahmoud. Boudoir was bred in England, winning only one of twelve races, but did place second in the classic Irish 1000 Guineas. She was relocated to the U.S. as a broodmare and established a powerful family. Boudoir had twelve foals, six of which were by Alibhai, including Your Hostess who is the dam of T.V. Commercial and Coraggioso, as well as being the second dam of Majestic Prince. Boudoir also produced stakes winner Flower Bed by Beau Pere, who in turn is the dam of Flower Bowl by Alibhai. Flower Bowl is the dam multi champion Bowl of Flowers and the brothers Graustark and His Majesty, both of which became important sires. Maid of Flight is a daughter of Count Fleet, the great Triple Crown Champion of 1943. Count Fleet, also named as Horse of the Year in 1943, was the champion two year old in the previous season, and later led the North American sire list in 1951. The dam of Maid of Flight was unraced Maidoduntreath, a daughter of the legendary Man O’ War. When the little dark brown colt foal of Maid of Flight came into the world, he had a solid pedigree although many of the successful descendants of Boudoir were still to come. Kelso became the lightning rod for the top breeders to seek and acquire members of this family. Kelso was on the small side, somewhat scrawny and very hard to deal with as a youngster. The decision to geld the colt was made when he became a two tear old. The change to his manhood was to try and calm him and make him more manageable. Unfortunately for Kelso, the change did not achieve the desired effect. Kelso never became a well mannered individual. Mrs. Du Pont was advised to sell Kelso. There were many well connected and experienced horsemen looking at him, but rejected the colt due to his plain appearance. As a two year old Kelso was trained by Dr. John Lee, and made three starts. All three races came at Atlantic City Race Course. He won his first start and finished second in his next two. He had shown to have talent but was still green and needed time to develop. He also needed a strong and experienced guiding hand to become a professional race horse, so enter future Hall of Fame trainer Carl Hanford. Hanford took his time with Kelso, allowing the young colt to grow up mentally and develop physically. Allaire du Pont was still trying to sell Kelso, but eased off when Hanford told her the colt was training very well and could become a good horse with time. Kelso did not begin his three year old campaign in 1960 until June 22, after the Triple Crown races had run. He went to the post as the even money favourite and won by ten lengths at Monmouth Park. Kelso’s next race was an allowance win by twelve lengths, leading to entry for his first stakes race, which came in the Arlington Classic. His effort was dull as he ended up eighth, beaten seven and one half lengths. Hanford was undeterred by the bad outing and had Kelso ready for the eight and one half furlong Choice Stakes back at Monmouth Park. Kelso returned in the winner’s circle with a commanding seven lengths score. This race started a seven race winning streak which saw him take the Jerome Handicap, Discovery Handicap, Lawrence Realization, and the two miles long Jockey Club Gold Cup. Kelso’s winning streak propelled him to the top of the three year old division and he earned his first Horse of the Year honour. He won in distances ranging from one mile to two miles, and set a track record in the Jockey Club Gold Cup with a time of 3:19 4/5. Kelso had arrived, and was only just getting warmed up. He had speed and could carry his speed to long distances. Graduating to the handicap ranks as a four year old, Kelso began the year with a tidy victory in a seven furlong allowance race at Aqueduct on May 19, 1961. He followed this with a close win in the Metropolitan Mile by a neck carrying 130 lbs. The following race was the Whitney at Aqueduct and carrying 130 lbs he finished second to Our Hope but was credited with the victory as Our Hope, carrying only 111 lbs, repeatedly interfered with Kelso and was disqualified. Next was a series of wins that solidified Kelso as one of the greatest. A five length win in the ten furlong Suburban Handicap toting 133 lbs, and an impressive Brooklyn Handicap victory carrying 136 lbs. The Washington Park Handicap followed, his first official loss of the year. Kelso was boxed in for most of the trip and could not get a clear run until too late. Three weeks later, Kelly was back in New York and captured the weight for age Woodward Stakes by eight lengths and followed up with a five length victory for his second consecutive Jockey Club Gold Cup. The final race of the year came at Laurel Race Course to tackle some of the world’s best in the Washington D.C. International, his first race on grass. Kelso ran a terrific race but came up three quarters of a length back of turf specialist T.V. Lark. However he had won seven of nine races and claimed top handicap horse honours and his second Horse of the Year title. Kelso was rated at 134 lbs on the Daily Racing Form’s free handicap, eight pounds higher than second rated T.V. Lark. During the previous two years, Eddie Arcaro had been the regular rider to Kelso. However the master jockey had retired following the 1961 season, so Kelso needed a new partner. Bill Shoemaker was hired to ride the champion. Kelso had a long rest as he had injured a hock in the D.C. International. He made his first start in 1962 in the Metropolitan Mile. Obviously needing the race, Kelso carried 133 lbs to a sixth place defeat to Carry Back. Seventeen days later he got back in the winner’s circle with a workmanlike win in a one mile allowance race. This was followed by two straight second place finishes in the Suburban Handicap and the Monmouth Handicap. Carry Back beat him again in the latter race, getting in at six pounds less than Kelso. Hanford noted that Shoemaker was not the right jockey for Kelso. He did not dispute Shoemaker’s talent, but Kelso needed a strong rider to steer him. “The Shoe” was very gifted and rode with minimal movement, trusting his hands to communicate with his mount. Kelso needed to be shaken up and ridden aggressively. Ismael “Milo” Valenzuela was just the type of jockey he needed. Valenzuela manned the controls for the next race, which was an easy allowance race victory on the Saratoga grass course, his first win on this type of surface. However, Valenzuela was not available for the next race, another grass allowance race, and Kelso finished fourth but only one and a half lengths behind. No worries though as Kelso and Valenzuela won the Stymie Handicap, the Woodward Stakes and the Jockey Club Gold Cup, the latter by ten lengths, in succession. Mrs. Du Pont and Hanford kept Kelso at Belmont for a start in the twelve furlong Man O’ War Stakes on the grass. He ended up second in this event, which was run on a soft course, to Beau Purple. On to Laurel for another shot at the Washington D.C. International, but another second place was all Kelso could do against the top European invader Match II. However he did beat his nemesis Carry Back by four and one half lengths. The year ended with a dominating win by five lengths in the Governor’s Plate at twelve furlongs on the first of December at Garden State Park. Kelso was named as the top handicap horse for the second consecutive year and as the Horse of the Year for the third time in a row. There was not much rest before the first start in 1963 as Kelso lined up for the Palm Beach Handicap at Hialeah on January 30. Two speed balls new to the handicap ranks emerged in this race, a seven furlong tilt, in Ridan and Jaipur. Kelso could not keep up with the blistering pace and faded to fourth. Staying at Hialeah for the nine furlong Seminole Handicap, Kelso exacted revenge and won the race over Ridan by two and three quarters lengths. He finished his Florida adventures finishing second to Beau Purple in the Widener Handicap, and winning the Gulfstream Park Handicap by three lengths carrying 130 lbs. Carl Hanford started Kelso in the John B. Campbell Handicap at Bowie Race Track and the gelding responded with a three quarters length victory over Crimson Satan. This race would be his last for almost three months, as Hanford decided to give his champion a rest at Woodstock Farm before the big summer handicaps in New York. On June 19, Kelso came out flying and won the Nassau County carrying 132 lbs. Two weeks later he took the ten furlong Suburban Handicap toting 133 lbs and then made it five wins in a row with his victory in the Whitney at Saratoga. Back to Aqueduct a month later, Kelso continued his roll by winning the Aqueduct Handicap carrying 134 lbs. The Woodward was next and back to weight for age racing. Kelso dominated Never Bend and Crimson Satan by four lengths to take his third consecutive title in this prestigious race. Going for his fourth consecutive victory in a major weight for age race, and his eight straight win on the year, Kelso captured the sixteen furlong Jockey Club Gold Cup yet again. His margin of victory was four lengths, and throughout the race the winner was never in doubt. So now it was back to Laurel for a third try at the D.C. International. It was déjà vu all over again. Kelso finished second, this time to grass champion Mongo. The D.C. International was the final race of the 1963 season for Kelso. As with the previous two years, the great gelding was named as the champion handicap horse and Horse of the Year. It was the third award of the former and the fourth award of the latter. Kelso was rated at 136 lbs on the Daily Racing Form’s free handicap, six pounds superior to second rated Beau Purple. The 1964 season for Kelso began in a new venue. Allaire du Pont and Carl Hanford decided to give Kelso a nice change of scenery and take him to the sunny climes of California. His first race came at Hollywood Park in the seven furlong Los Angeles Handicap. Kelso was away slowly and never really contended in the race, finishing a lacklustre eighth. Two weeks later he started in the Californian also at Hollywood Park and was impeded coming into the stretch, thus losing his momentum and the race. Having not won on the left coast, Kelso came back to familiar ground at Aqueduct and won a nine furlong handicap carrying 136 lbs. He made it to the post for the traditional July 4 running of the historic Suburban Handicap. He was assigned 131 lbs for the ten furlong race and came down the home lane with a rush but could not catch Iron Peg, who was carrying only 116 lbs, and lost by a head. Mongo would beat Kelso by a neck in the next race, the Monmouth Handicap. Kelso was however four lengths clear of the third placed finisher Gun Bow, remember that name. The Brooklyn Handicap was only seven days later and Gun Bow captured the race carrying 122 lbs with Kelso and his 130 lbs back in fifth. Kelso had been bumped as the gate opened which compromised his chances as he never was a factor. Kelso got back to winning form with victories in an allowance race of nine furlongs on the Saratoga grass course, setting a new track record, and the Aqueduct Handicap, which was also nine furlongs but on dirt. Gun Bow squeezed out a nose victory over Kelso in the Woodward Stakes, thus denying our hero a fourth straight win. However, Kelso in his next two starts would remind everyone who might have thought that he was not the same champion as before, a powerful display of his talent. The first of the two races was the Jockey Club Gold Cup, the race he owned for the previous four years. Kelso’s performance in this endurance test of two miles was epic. He won by five and one half lengths over the good emerging three year olds Roman Brother and Quadrangle in the time 3:19 1/5, setting a new world record for the distance that to this day has never been beaten. In winning his fifth consecutive Gold Cup, Kelso could have lobbied to have the race name changed to the Kelso Gold Cup and no one would have argued. His second career defining race came eleven days later at Laurel Race Course in his fourth attempt to win the Washington D.C. International. This time Kelso not only won the race but he also set a new American record for the twelve furlongs in the sizzling time of 2:23 4/5. To top off his feat, his arch nemesis Gun Bow was four and one half lengths behind in second place. Kelso had finally won the one race that had eluded him in the past. There wasn’t a dry eye in the house as the great champion came back to the winner’s circle to accept his just rewards. Kelso ended the year on that high note and when the votes for Horse of the Year were tabulated, the mighty Kelso won his fifth straight award. He also garnered his fourth champion handicap horse award and was rated at 136 lbs on the Daily Racing Form free handicap, but he had to share the top spot in the latter with his rival Gun Bow. Kelso did all of this at the age of seven, an age when most horses were either retired or had lost a step or two. A long rest came to Kelso before he began his seventh racing campaign. The year was not as extensive as in the past and he was not as consistent as he used to be either. However Kelso twice displayed his fierce competitiveness and talent when he won the Whitney Handicap by a nose at Saratoga and then for his finale of the year he took the Stymie Handicap by eight lengths. The season lasted only three months for Kelso which ended with three wins, the Diamond State Stakes was his other victory that year, and no year-end awards came his way. His trophy case was probably too full anyway. Kelso made one start as a nine year old which came on March 2, 1966. He finished fourth in a six furlong allowance race and came back to the barn with a hairline fracture of the inside sesamoid bone in his right foot. Mrs. Du Pont immediately retired her champion horse from racing. Kelso retired with earnings of $1,977,869 which was a record that stood until Affirmed surpassed the mark in 1979. Allaire du Pont had Kelso’s fracture operated on and repaired, and then brought him home to Woodstock Farm in Maryland. Here he was pampered and visited by many fans and admirers. He received so much fan mail that there was a separate mail box with his name on it placed on the grounds to accommodate the onslaught. Visitors who had not seen Kelso up close were stunned to see a rather plain looking average sized horse galloping around his paddock. He did not look like some preconceived regal champion of fiction. He had very strong muscling over his loins, wide hips and very good hip to hock length. These outstanding confirmation qualities transmitted his low smooth action when he ran, and his muscle tone was flat rather than pronounced which was what a true stayer would have. The most distinguished feature of Kelso in appearance was his almost Arabian like head. His groom at Woodstock, Junior Clevenger, always made sure Kelly was presented with a gleaming brown coat shining in the Maryland sunshine. Kelso was never a warm and fuzzy soul, but he did show tremendous affection to those he cared about, which include Mrs. Du Pont. A young fan stricken with polio named Heather Noble had started a Kelso Fan Club in 1963, and published Kelsoland, a newsletter sent to members of the growing club. Heather was with Allaire du Pont in the private box at Laurel when Kelso won his D.C. International. The two had become close and Mrs. Du Pont would name a half sister of Kelso “Heather Noble” to honour her young friend. Mrs. Du Pont exercised Kelso as a hunter, and would have him trained for show jumping events in which he did very well, earning a few ribbons. She brought the champion to various horse shows and charity events to help raise money. When Kelso started to come down with arthritis in 1974, Allaire du Pont would curtail his hunter work and limit his public appearances. Throughout his early retirement from the track, “Kelly” was constantly in the company another gelding named Spray and a dog named Charlie Potatoes. Charlie Potatoes had been his constant friend at the track and moved in with Kelso to Woodstock. When Spray died, another gelding named Pete, who had raced with the name Sea Spirit and won the 1961 Jersey Derby, took his place. The two former stakes winners became inseparable. Kelso enjoyed many different treats, but sugar and chocolate were by far his favourite. On October 15, 1983, twenty-six year old Kelso appeared at Belmont just prior to the Jockey Club Gold Cup. His appearance was in tandem with another legendary gelding who won the race three times in his career. This would be Forego. Entered in the race was the current star gelding, and soon to be legend, John Henry. These three are considered as the three greatest American geldings in the second half of the twentieth century. Kelso and Forego helped to lead the field onto the track for the post parade. The appearance by the two retired geldings was to raise money for the Thoroughbred Retirement Fund Charity. It would be the last public appearance made by Kelso. Kelso had always battled colic throughout his life. The following day after he returned home to Woodstock, he came down with a serious bout of colic. He was treated for his condition and he seemed to respond well, but an hour later Kelso began to tremble and was fading. The great Kelso died at seven pm. that evening. He was buried in a quiet ceremony the following day. Allaire du Pont was devastated and did not make a public appearance for a long time after. What can one say about Kelso that has not been said before? He was simply the best horse over a long racing career ever witnessed. I can’t add to the long list of superlatives so I will give the final words to one of the greatest turf writers I have ever read, Joe Hirsch. great article did not know this horse at all but clearly amazing I was very sad the horse passed away from colic hope he wasn’t in pain? He was lucky to have such a good owner and trainers. I agree Kelso was the best. They don’t make them like Kelso anymore. What a warrior. In my humble opinion Kelso was the best ever.